Name that Breed! | Will My Dog Hate Me? I was hoping I could post a photo of my dog to see if some really swell dog experts could tell us what he is… We have a dog that we adopted as a puppy from a puppy rescue group here in Colorado. Were told he was an Australian Shep/Border collie mix but he looks more like a corgie shepherd mix and weighs 65 pounds. We don’t want a DNA test. We just want 100 different opinions so that we can keep making up new answers when people ask us what kind of dog he is. Can I send you a photo of Wilson the Dog to post on your very entertaining blog? Why not, I thought, especially since Virginia was so flattering? I said sure, and requested additional info about Wilson. Wilson: A basket case or just having an identity crisis? Hi. I am attaching photos of Wilson the Mystery Dog (WMD). Appearance: He is about 2 feet high, 65 pounds. Very thick, coarse hair which, as far as I can tell, sheds year round. Large, “Huge Harold” hind feet. Red spots on belly. Behavior: Loves the cold, but definitely not full immersion in mountain lakes, wading pools. Lovable but does not lick face (an attribute, in my book). Hand signal trained. Great eye contact (except around squirrels. Also, cats and birds.). Ears are always in that Red Alert stance, except when we are walking or when he is being submissive. A natural herder (at first, less so now that he is older). Very agile. Loves to gallop (when hiking in our Colorado mountains off leash, which of course, we NEVER do…). We were told he is an Australian Shepherd/Border Collie mix but are are pretty sure that the puppy rescue volunteers made that up on the fly. Also, we already had out our check book and our teenage daughter had Wilson in a death cuddle. So… what do you think? All guesses welcome. I’m intrigued by the red spots and the big feet. Virginia didn't mention Wilson's automotive skills. Another clue to his identity? By the way, Virginia, I wouldn’t count on 100 guesses. But I’ll bet the ones that do come in are really high quality. 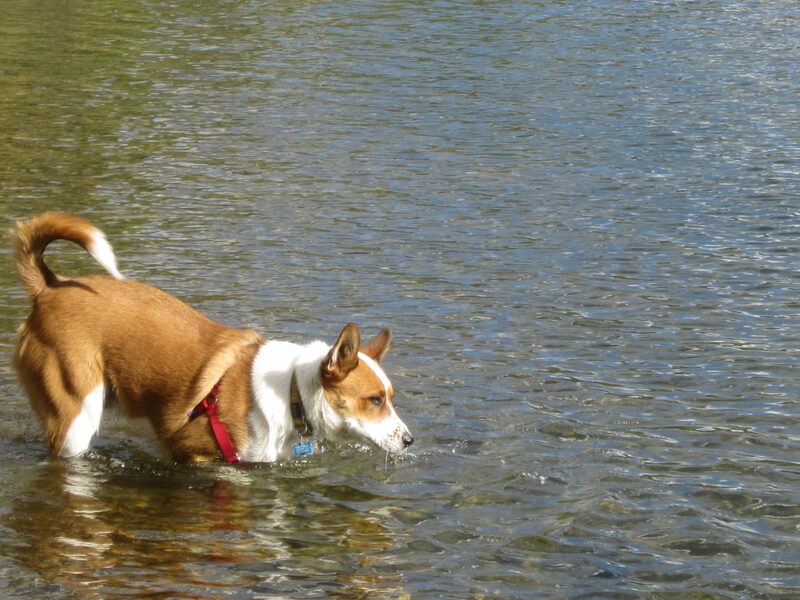 It’s hard to see how tall he is since he’s in the river, but he could be a Corgi-Cattle Dog mix. He actually looks A LOT like a dog that comes to our dog park and his owner didn’t know what he was a mix of either! I kind of think Cattle Dog is the predominant trait. Heck ,who knows? Maybe a Dingo? Virginia said Wilson is “2 feet high” — which is tall for a Corgi, isn’t it? Even though it’s been years I still can’t hear the word “dingo” without hearing Meryl Streep saying “The dingo ate my baby” in an Australian accent — and Elaine on Seinfeld doing an imitation of her saying it. Dingos probably need a support group. Me too! I will never be able to think of dingos any other way. Total = One Adorable Lovable Mutt! It seems very clear to us that Wilson is a 100% purebred Lover. Two things … first I fear when it says he came from a puppy rescue. I did some undercover work on two “puppy rescues” here in CO a few years ago, and essentially they are a front for an old puppy mill. I could not prove they were breeding these dogs, but I also could not confirm their claimed sources of puppies (and I spent a month calling all the places they claim give them puppies). Plus, what I saw at their events were NOT adoptions, they were puppy sales pure and simple. Like 1 every 7 minutes. Either way, pups from these groups have a history of both medical and behavioral issues common with puppy mill dogs, so I hope, hope, hope Wilson is a happy, healthy boy. As for breed … his head and coat style could be a smooth coat red or brown border collie, the ear shape and all that looks right to me (much like Lilly). Maybe there is some corgi in there, with the relative lankiness coming from the border collie side. 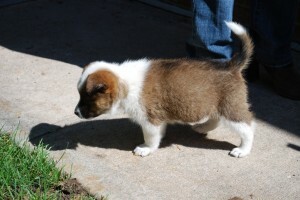 And, his coloring is sort of corgi-like. And, please, look at that muscular haunch! Strong boy! I have a friend who trains Aussies and Border Collies and she says no way is he either. I do agree he must have some Cattle Dog in him. Maybe some Kelpie? I know the colouring is wrong but he has a similar body type. A Karelian Bear Dog? Okay, that one is probably way off. Congratulations to Virginia! I have no idea what my dog is either and it is a lot of fun having people guess. WordPress is very annoying. It declined to send me emails alerting me to comments today. I was wondering why there was this silence until I checked the dashboard! Ok. Roxanne, I have to admit I worried about the six weeks picture of Wilson — a bit too early for a puppy to be out away from its mother — but don’t know as much about the situation in Colorado as you do. Wilson seems very healthy at 2 years though. 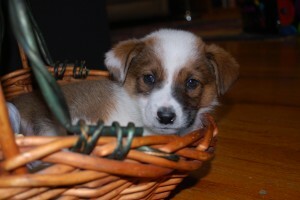 So, we’re getting some Corgi and Dingo votes and a consensus that Wilson is awfully cute! I’m in on the Wilson is awfully cute bandwagon! 🙂 I don’t really have any other ideas than the ones thrown out there though! With the tail curled over like that, I’m thinking maybe some Akita in there. Hey, this is fun. Could I send a photo of my dog Kelly for guesses?! Fun idea! I’ve wondered what Bella is too. The rescue said Beagle/JRT, so we’ve always just gone with that, but who knows. BOL! I sense some sort of weekly feature coming on! My brother Felix is a Mystery Dog too and Mom would LOVE opinions on what he is 🙂 This was fun! We like the dingo suggestion, or even the Basenji, but when Mom looks at that sweet baby Wilcon picture, she says he looks like the Cattle Dog she had when she was young. I’m going to go out on a limb here and suggest that Wilson might be some kind of indigenous dog like the Australian dingo or the Indian pariah. Perhaps with a bit of mix in him. The fish hook tail and water pic looks awfully familiar. Check out the Indian Pariah dog site, especially posts towards the end of 2010. A lot of stories about Indidogs that relocated overseas with their families. The coats became longer, in some instances making them look lab-corgi like. Sorry, I’m having trouble putting a link here at the moment. What are Huge Harold feet?! Thanks for checking Wilson out. Your guesses are very helpful. I’ll go back and reply to some comments individually. Huge Harold is a/was children’s book (ok., now I’m really dating myself). Harold was an oversized rabbit with especially large feet. 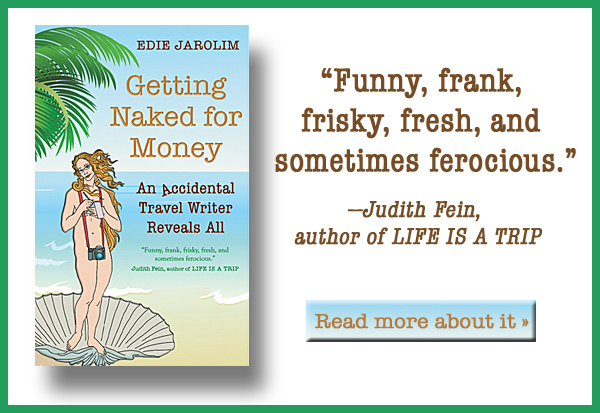 Thanks so much Edie for the posting! I think he’s part Corgi and part Cattle Dog. He’s very cute. If I would have to hazzard a guess, I would say Cattle Dog, because of the head and ears and Husky, because of the tail. When I see his side profile, I’m thinking German Shepherd, but the colouring isn’t there. I had to click on the Huge Harold link! awww! What a great term for description! I’d say there’s some Corgi, Austrailian shephard, and/or Basenji in him? Either way, what a cutie! I have a beautiful Corgi mix we adopted as a 2-year-old from a Corgi rescue group here in Dallas. They weren’t sure what he was mixed with, but they think he’s a Corgi/Sheltie mix. Your dog definitely has Corgi coloring and a few Corgi physical traits, but the sheer size and muscularity of his haunches alone are something else! I can see the Aussie and Cattle Dog arguments, but especially the Cattle Dog possibility. More than likely there’s something else there, too. Hi–Dog Trainer here. Really hard to tell from ur photos. 2′ 65#? Very muscular, impervious to water…hmm. Def looks from the shot of him in the water that he’s atleast 1/2 herding dog. I’d say head more like an Australian Cattle Dog. Coloring? Also, ACDs have an undercoat & hair so they shed alot. Not ACD coloring to be sure…that could come from alot of places. If his legs are short-ish I’d say Corgi’s a good guess. Is he mostly silent? Then Basenji quite possibly. Just don’t have enough to go on here but that’s my guess. It’s also possible that he’s a Korean Jindo Dog but highly doubt it. There are only a couple hundred of them in this countey. Sorry! Just measured Wilson’s front legs are 16 inches floor to belly. Back legs are about 18 inches (Wilson was skeptical of the yard stick). Wow. I’d never heard of Besenji but Wilson looks exactly like a Besenji. I don’t know what their sizes are. I’ll try and send Edie another photo to compare. That cute face and coloring looks like an Australian Cattle Dog (which has dingo in its line), body is more Border Collie, and the tail looks Akita or husky or maybe Basenji. Whatever the mix, looks like a delightfully fun dog. And probably smart too with that herding breed ancestry. Wilson is adorable, but I got a laugh out of the acronym: WMD. Wilson the Mystery Dog, or Weapon of Mass Destruction? I’m guessing both. As to his breed, he looks suspiciously like my dog, Paisley, who was adopted as an adult from the ASPCA. Unfortunately, we don’t know what breed she is, either, though we were told Australian Cattle Dog. Based solely on the heel nips I suffer as we make our way out the door in the morning, I’m certain she’s of the herding group. I’m with the Cattle Dog crowd on this one, I think. Though I wonder if there’s some terrier mixed in… Wilson’s face reminds me of a fox terrier. I’ll put $5 on smooth coated collie crossed with Australian cattle dog. Except that he looks a little too tall, I’d normally guess “universal” dog. That’s what every dog in the world ends up looking like when dogs mate freely–mid sized, athletic build, reddish brown coat. Of course I recently heard an interview on the radio of a black writer (or so he thought) who had his own DNA tested. He found he was 57% caucasion, 39% native american, and 4% asian. Not one piece of his DNA came from Africa. If Wilson had his DNA tested, he might discover he’s really a cat! My first guess would be that the rescuer confused Australian Shepherd (which I don’t see at all) with Australian Cattle Dog. Corgi is tempting, but I don’t see how you get much Corgi (or Basenji)and wind up that tall and that big overall. I would want to know if Wilson is a leaper, or a herder, or just obviously intellitgent. Reminds me of Pack of Two, in which author was told the dog she was adopting was a German Shepherd mix, which she eventually realized was shelter-speak for “We have absolutely no idea.” So maybe Wilson is a Whani. Corgi-Basset! I just gotta think the ears are Corgi and the feet are Basset Hound, but who knows what is in between? My friend calls dogs like Wilson (and our Ebony and Joy) Canarlies (You can hardly tell what mix they are) He IS super cute. Ha, trust you to worry (as I did too) about the red spots! I have emailed Virginia to come by and weigh in on all these comments — so far no response! Our vet said that the red spots are indicative of heelers. They are normal doggy spots, not like a rash or anything. Sorry it took so long for me to get back on the blog. Apparently grown ups can get whooping cough and strep so I was out of commission for a while. In response to your many wonderful comments: While we did get Wilson from a puppy rescue, it was up in Ft. Collins and was run by a bunch of mom-type volunteers. We were on “alert” for a puppy mill as well, since we’re pretty sure that our last rescue dog, Buzz, was his mother’s brother. So many issues…. Anyway, Wilson is the anti-Buzz. He is not neurotic in any way. He does that funny dog-talking thing when he is excited, or ready for our daily run (and I’m still reading the paper). He would be a great agility dog (but won’t have that opportunity, because I have enough competition in my life). He is a great leaper but not a particularly good catcher (can’t catch balls, frisbees). On the Corgi idea, we were sure for awhile that he was part Corgi, but then he kept growing. Also, he barks at other dogs from his yard, and I thought Corgi’s were quiet. Is timid over the goofiest things. Loves doggy day care but hates dog parks. Not wild about the dark. I rejected the DNA idea because of an NPR story that seemed to suggest that, in the animal kingdom, DNA testing for breed is still not an exact science. Sorry you were sick but glad you enjoyed this guess-fest. It was fun for all of us too. Just looked at a photo of a Besenji on line, as I had never heard of this breed. Wilson looks just like a Besenji, only much bigger. Also, he barks. Yes! I’d heard of Basenjis but didn’t realize the resemblance until I looked the breed up now. 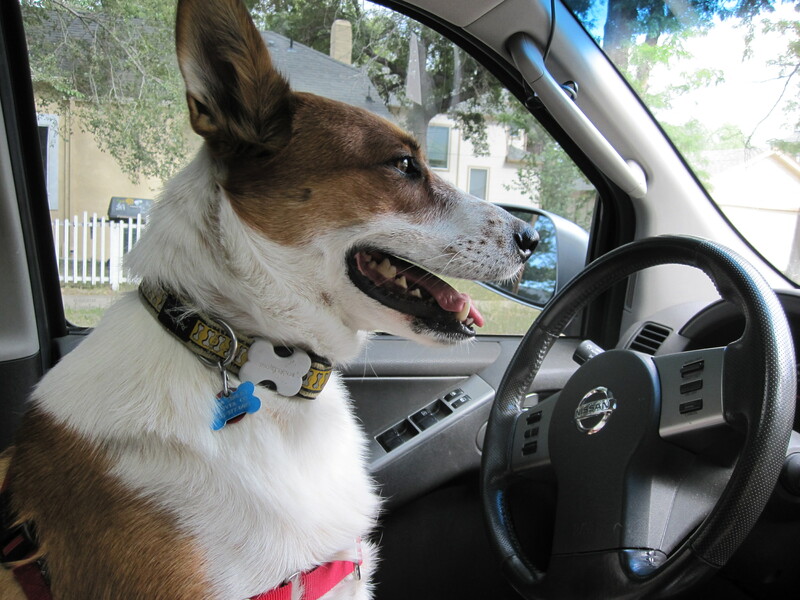 Years ago I had a Basenji and there are a much smaller dog, males max out at about 25 lbs and 16 inches or so in height. They have no undercoat, no doggie odor and act very cat like. Mine loved to perch on the back of the couch. They also have a telltale wrinkled forhead. They make a kiyi noise, can growl and make other conversational sounds. They are a sight hound. They sound wonderful. I want one (shhhh… don’t tell Frankie). Besenji and Austrailian Cattle dog mix. On the Besenji side — just google Besenji — Wilson looks exactly like one — including behaviors — with these exceptions: 1. He’s bigger, tail is a bit longer, sheds all year and he barks. On the ACD side: He has a double coat of hair that sheds all year long. Nothing that a good vacuum can’t handle. We’re off to run Wilson’s sillies out! Thank YOU for inspiring it! In fact, it’s been so much fun, that a few of us — Peggy Frezon, Pup Fan (whose name I don’t know) and I, so far — are going to do a Name that Breed blog hop on February 4. We’ll post about it too, but if any of you see this comment and want to join, let me know. All you need is a mystery mutt that you want to have identified and a blog. Especially welcome: Badge creators. Wilson is very cute and awesome. Pembroke-Welsh-Corgi-Basenji is my best guess. The face seems to favor the Corgi and the body/tail is similar to a Basenji. Did anyone ask if it barks or yodels?